Cub and beaver scouts from the Ist South West Cheshire District celebrated the group’s 100th birthday with a special cake made by our very own bakery students. The celebration was doubly special because this year is both the centenary of the Crewe based group, which is one of the oldest in the country, and of the cub scout movement nationwide. Members and their families were joined by key officials of the movement at a party last weekend at a scout camp at Linnet Clough in Marple near Stockport. The four tier cake, decorated with scouting themes including a tent, campfire, neckerchief, map and badges, provided the centrepiece for the party feast. 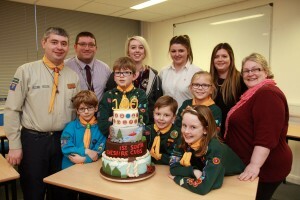 Twenty Level 3 Diploma in Professional Bakery students developed the design and produced the cake after a request from Reaseheath Food Technologist Jenny Newall, who is an Assistant Cub Scout Leader of the group. The Ist South West Cheshire group meets weekly in the scout hall in Bedford Street, Crewe, and has a membership of 31 cub scouts, 24 beavers and over 40 scouts.